The usual way for White to play is the immediate 3-3 invasion. is indicated here, because of . may be at a, b or c. At c is often seen in the West because of an 'old information' effect: the pros have hardly played this since 1975, but it's still in the books in English. This is the modern line. at a instead is bad. SnotNose: I've been avoiding this modern line only because I'm not sure what to do with . In the older variation (refered to above) I know a bit more about the aji, because I find discussion of it in books. I've seen it said that moving out immediately with in this modern version is "severe". I assume this means making a diagonal move, in which case there will be a great chase and fight. Is it so clear that White can do enough in this fight to make up for helping black with his moyo? I'm nervous about it. Can anyone illustrate with some typical follow-up moves? Has this appeared in anyone's game that they care to show? Pro game is okay too. 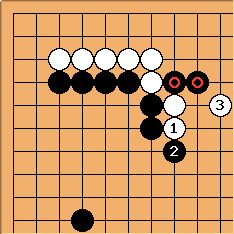 Does anyone like to play this (as White) and, if so, why? HolIgor: There is a proverb that strong players play straight and weak players play diagonals. Not to take it literally but I'd prefer a straight move. Black has a small moyo on the left. 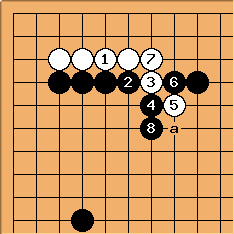 On the right Black has two weak stones on the fourth line with an open skirt. 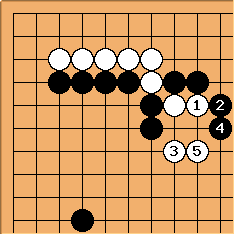 White has to attack those two stones and as Black is busy defending them, the moyo would be erased. White can die as well; as in yesterday's game between Cho U and O Meien. Yesterday's game? please add the date and the tournament information so that we will be able to find the game in another 3 weeks. Fhayashi Perhaps October 30, 2003 - as HolIgors edit was on Oct. 31st. Black has some weak points on both sides. I think I'd try it one of these days. SnotNose: Fascinating! 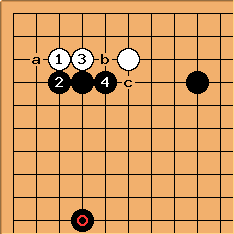 If ever I get the courage to try this, I will not play diagonally but follow the preceding diagram. Still, I'd feel better with a few larger examples as models. I'll keep an eye out in pro games (not having access to GoBase (long story, and not interesting either), I can't do a search--but I do review pro games and this is bound to come up eventually). Thanks to contributors! DJ: I have two questions here. 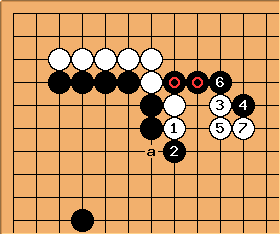 One is, IMVVVHO (a lowly 2k opinion...) setting the white stone in motion right away, without waiting to see how the surrounding positions evolve, seems a bit reckless to me, I would leave it there for the time being as aji. Could you quote the source that said : "moving out immediately with in this modern version is severe"? SnotNose: I checked the text of ThePowerOfTheStarPoint and "immediately" is the word used. Moreover, it is written that the prospect of White moving out immediately is "ominous" for Black. Sort of makes it sound like any other move would be slack. Anyway, for the sake of discussion, suppose we assume that the board is as follows. Charles I don't see how you can possibly discuss this question in local terms. DJ: That's exactly my point, I wouldn't know what to do with that stone without knowing what is around it. unkx80: Besides that, how would you answer ?